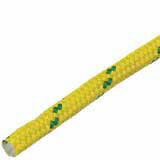 9/16" x 150' Yale Double Braid Esterlon **Yellow** Hank. This double braided rope is ideal for use in lowering systems, supplying unmatched rope strength and durability. Double Esterlon is the strongest double braided polyester rope available. It has low stretch and excellent abrasion resistance which is further enhanced by our tree grade Maxijacket coatings. These are color coded for diameter which makes finding the right rope for the right job easier. Double Esterlon is a workhorse for lowering devices, pulleys, speed lines, and slings. Average Tensile Strength: 13,700 lbs.